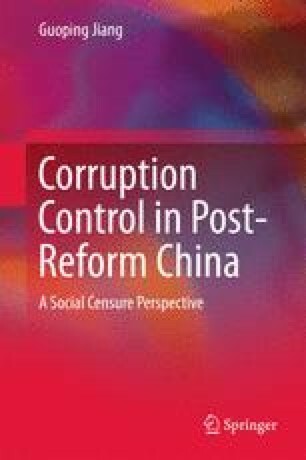 As mentioned earlier, my research interests of the study lies in the contradiction between continuous efforts against corruption by Chinese government and pessimistic corruption situation in post-reform China. Different from most of previous studies which follow the ruling group’s logic, I question the nature of corruption by adopting social censure theory which is an “anti-mainstream” perspective. Data will be collected to testify the social censure theory. Then, I shall try to explore the status of law (rule by law or rule of law) which can influence the ruling group’ ability of manipulation on social censure. More specifically, this study explores the relationships between the status of law, social censure and outcome of anti-corruption in post-reform Mainland China The key concern of the study is how low law status allows or encourages the censure on corruption on targets arbitrarily and selectively by the ruling group or political elites, which renders anticorruption actions not well justified or supported.